Lightly breaded and fried tossed in caramel rum hot sauce. The name is misleading because this appetizer resembles boneless wings more than a beignet. The flavor is absolutely addictive and has the right amount of spiciness. When dipped into the blue cheese dressing it becomes even more delicious. A few bites were a little chewy, but we’d still order this again. 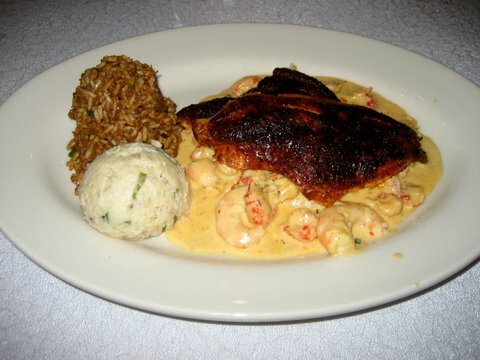 Blackened with house rub, served over shrimp and crawfish in a creamy Cajun sauce. The portion of this dish is big enough for two. 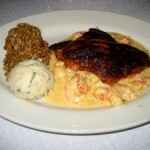 It comes with two pieces of grilled catfish and a large serving of shrimp. You get two side items with this entree, so we got the yummy smashed potatoes and the dirty rice. The catfish was very tender, juicy, and the house rub gives it a nice subtle flavor. 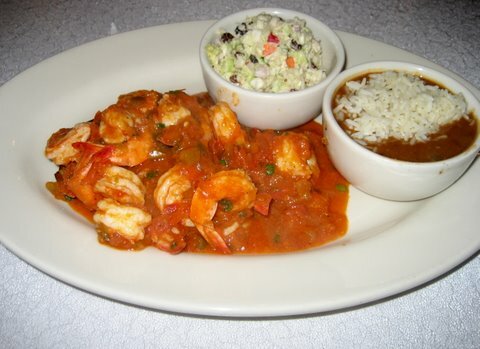 We were disappointed by the Cajun sauce because it didn’t have too much flavor – it tasted just like cream. Since this is a Cajun place, we expected there to be some spice. Overall though, this is a solid choice. 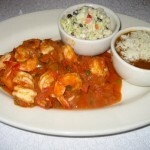 12 jumbo gulf shrimp, sautéed in Creole tomato sauce, served over grilled eggplant. From the menu description, this dish sounded unique and flavorful. 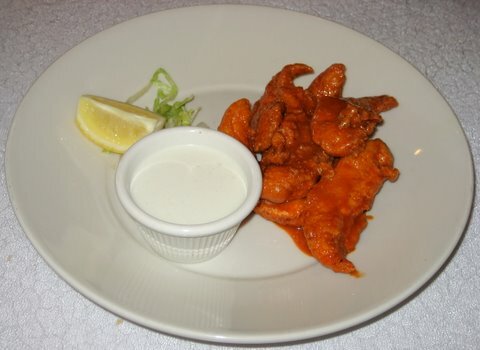 The shrimp was cooked very well but this dish lacked personality. The “Creole” sauce tasted nothing more than a bland tomato sauce and this set the tone for the dish. The eggplant did not add any pizzazz either since it was not seasoned and hid under the sauce. For our two sides, we chose the mouth-wateringly good coleslaw and the red beans and rice (average). Those of you that are looking for a plain and simple dish that isn’t fried or creamy, might enjoy this. 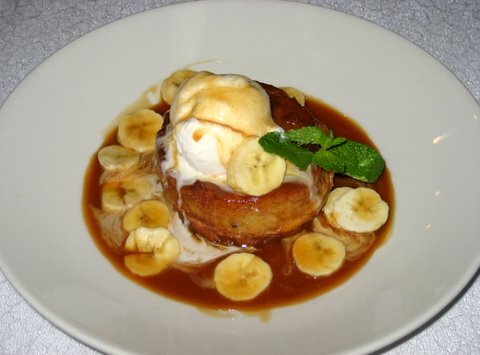 Croissant bread pudding served warm with sliced bananas in caramel rum butter sauce, topped with vanilla bean ice cream. This was tantalizingly good and quite a generous portion too. We didn’t know what to expect and thought the banana slices might be baked into the bread directly, but they were separate. The bread pudding was moist with a somewhat plain flavor by itself, but the caramel sauce was a sweet and necessary addition. The ice cream complemented the richness of the bread pudding well. We dined on a weekday evening and were surprised to find the place packed! After waiting a few minutes, we were seated by the hostess, who is also the owner of Mama Roux. Our waiter was friendly and answered all our questions. He brought our drinks and gave us a complimentary basket of bread. He had someone following him, and we assumed that it was a waiter-in-training. Both of them attended to us at appropriate intervals. Our food came out in a timely manner. Our waters were refilled by the busboy, but each time we had to ask him for the water with no ice. At the end of our meal, our waiter informed us that since it was our first time, we could choose a complimentary dessert! How is that for southern hospitality…the gesture was not lost on us. They also asked us to sign their guestbook, and we happily obliged. Mama Roux is an unassuming eatery located in a strip-mall adjacent to Wal-mart. Due to its location, one would think this would be a fast-food type eatery with bargain prices. And although the décor is minimalistic with a black and white wall colors and a few New Orleans painting; the interior still has a non-strip mall feel. It doesn’t feel like you are in a Cajun restaurant at all, but the white tablecloths give it more than just a casual feel. If you dim the lights and placed candles on the table, this could turn into a romantic setting. One problem we had was that we were almost perspiring from the restaurant’s warm temperature. This was primarily due to our table’s proximity to the window, even though the blinds were closed. 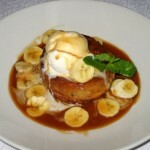 Mama Roux is good for couples, groups, or families, and parking is easy since it is located in a strip-mall. With limited options for authentic Cajun food in Austin, Mama Roux is worth a try, but keep in mind their prices are a little steep.